Due to the growing geriatric population, Dr. Alisa Kauffman would like to share her expertise with those who are passionate to help provide quality care to this underserved population. Becoming a geriatric house call dentist is an incredible opportunity for those who want to make a difference and have retired or are looking to add an additional stream of income.Dr. Kauffman has been practicing exclusively in geriatrics for more than 20 years and is widely known for her Geriatric House Call Dentist practice. 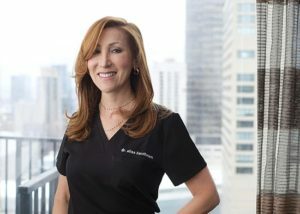 Voted as a top woman dentist in the U.S, Dr. Alisa Kauffman makes dental house calls for the elderly and frail. She has advanced training in geriatrics, dentures, hospice care, and all forms of dementia. Her goal is to triage the situation to ensure the patient is receiving proper nutrition for their overall oral health. Dr. Kauffman has heard the cry of the voiceless and revolutionized the field of home health care dentistry with her newly founded geriatric dental consulting practice. Why do it? In short, to serve this underserved population that has no voice. There is a huge need for a desperate and vulnerable community. You could be the solution to their need. How does it work? Dr. Kauffman will assist you in developing your craft to help those in need of home-based geriatric dentistry. What is my revenue potential? You could earn 40-120K a year by working 10 hours a week with no extra overhead by being a house call dentist! What is the Startup Process like? Dr. Kauffman will provide you with the information you need to get started. What instruments and materials do I need? Dr. Kauffman is ready and able guide you through the tools you’ll need to be successful with your geriatric dental home health practice. How do I find clients? Dr. Kauffman will assist you in finding clients through marketing, nursing homes, and other local outreach opportunities. What marketing materials do I need? Dr. Kauffman has access to marketing services to help you succeed in reaching this population. If you are a dentist and would like to know more about how Dr. Kauffman can help you, please fill out the form below.